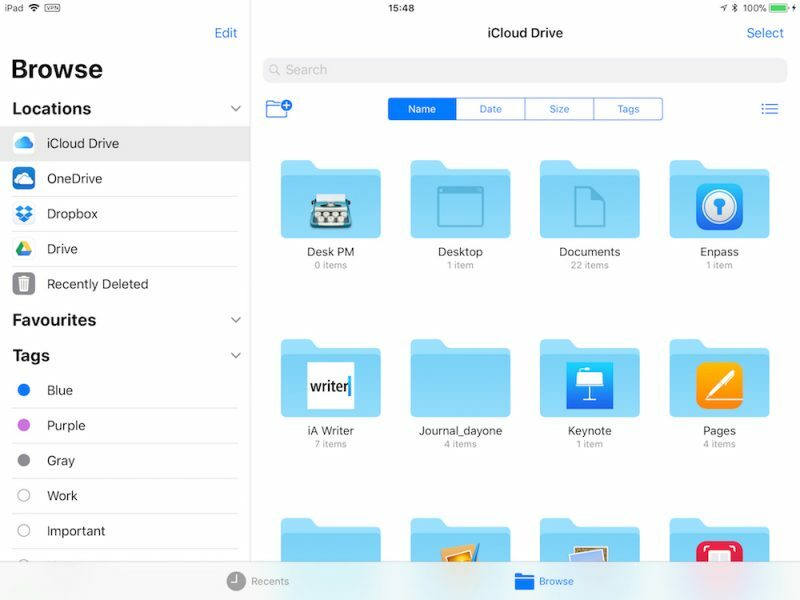 The new Files app in iOS 11 replaces iCloud Drive, offers a lot more functionality than its predecessor, and provides perhaps the best argument yet for using an iPad as your go-to mobile computer. In Files, you have access not only to the files stored on your device and in iCloud, but also to those stored in third-party services that support integration with the app. 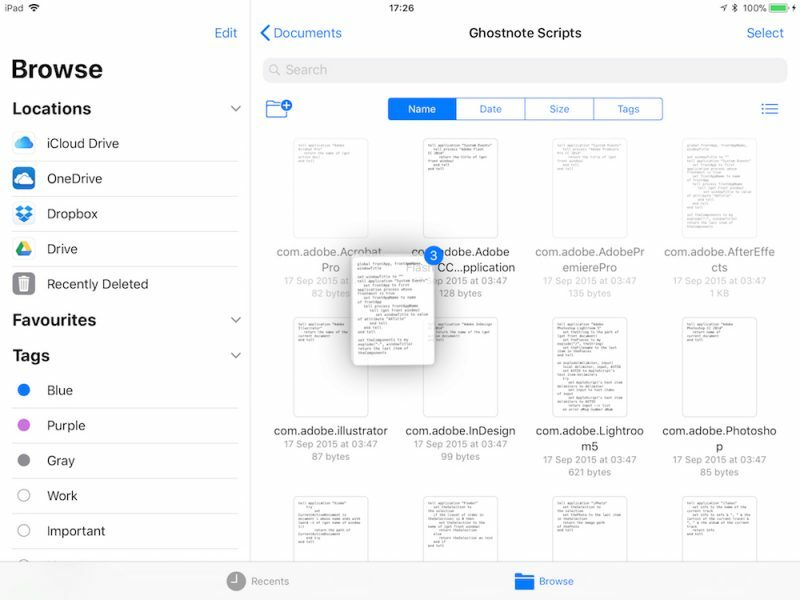 Files also exploits all of the new multitasking gestures in iOS 11, making its file organization capabilities even more powerful. The Files app interface is very straightforward, although it varies from device to device and based on orientation, with various combinations using multiple columns, single columns with pages, or pop-overs. For the purposes of this overview, we'll look at using an iPad in landscape orientation, the most common setup for those doing productivity work. Down the left side of the screen, in the Browse column, are links to your file sources, Favorites, and Tags to view files that are tagged with a particular color. Over in the main window you'll see the files and folders in the selected location, which you can view by name, date, size, or tags. There's a button on the right of these options that you can tap to switch between list and icon view, while the button on the left lets you create a new folder. At the bottom of the screen are two buttons to switch between the default Browse view and a Recents view, which is useful for returning to the files you were last working with. In either view, you can open a file in the main window simply by tapping it, or you can perform a long press on a file or folder to access a range of options, including rename, share, tag, favorite, and more. 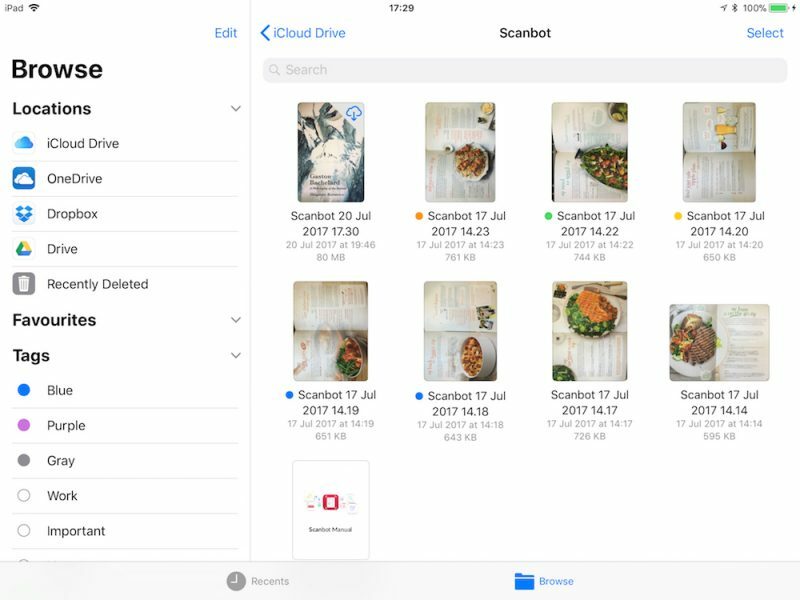 However, the best thing about the Files app is that you can organize multiple files quickly and easily by utilizing the new drag-and-drop features exclusive to iOS 11. Tap and hold a file you want to move, and it will expand slightly, ready to follow your finger around the screen. To move additional files, tap them while holding the original file and they will stack up underneath your finger. Keeping the same finger on the screen, use another finger – preferably one on your other hand – to browse the Files interface and locate a destination folder for the selected files. With the destination folder open, simply lift your finger from the screen to drop the files inside. There's nothing to stop you from using iOS 11 drag-and-drop gestures to take files out of the Files app and move them into other iOS apps, as long as the app in question supports the file type. You might drag an image file into the Photos app to add it to your Photos Library, for example. If you're uncomfortable using drag-and-drop gestures, you can organize your files using more traditional touch controls. Here's how. Navigate to the folder containing the files you want to work with, and tap the Select button at the top-right of the screen. The Browse column will dim to put the focus on the currently selected folder. From here, you can tap one or more files to add a check mark against them indicating they've been selected for an action. A list of possible actions will appear along the bottom of the screen, including the option to duplicate or delete the file(s). Tap "Share" to bring up the iOS Share sheet, where you can send the file(s) to other people or apps, as well as access copy, print, and other actions. 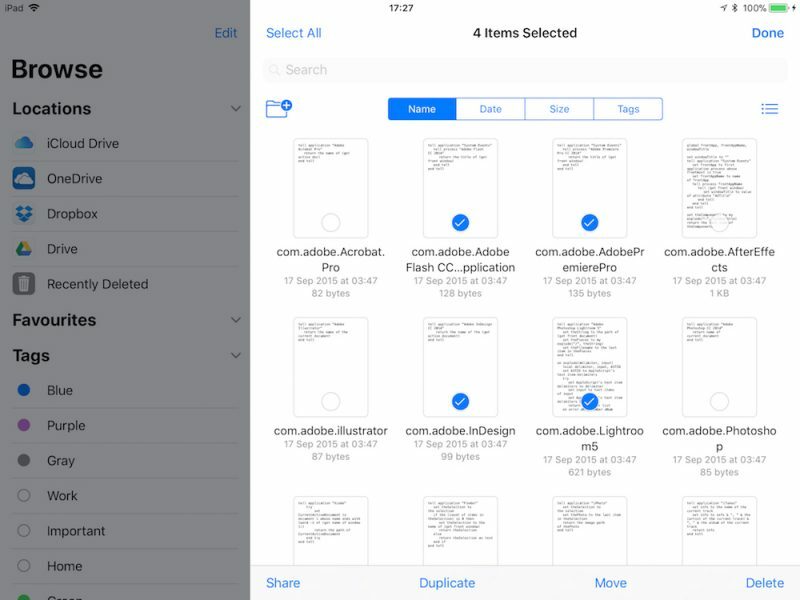 Tap the "Move" option and the Files app will present you with a directory tree, allowing you to navigate to the desired location for the file or files you've selected. Using tags in the new Files app will help you locate particular files more easily, and they work much the same as tags do in macOS. As you'd expect, tapping a colored tag in the Browse column shows you all the files you've assigned that particular tag. To tag a file or folder, simply tap and hold it, and then drag it onto a tag in the sidebar. If you install a third-party storage app on your iOS device, it should automatically appear in the Files app under the Locations list. If the service doesn't appear, then it doesn't yet support Files integration. Services that do support Files app integration include Google Drive, Box, Dropbox, OneDrive, and Transmit, with more to come soon. I guess slowly teaching them. It still feels like Apple has managed to make file management a whole lot more confusing. Who really knows where things are stored anymore, how you get to them and what results in them (not) being copied/moved/opened in place. With traditional file management, at least there was a chance I could explain it to my mom or dad (whether they would listen is another matter), now even I have no idea what's going on. I suppose at least Apple has created a level playing field where nobody has an intuition about how things work anymore. I wonder how elders are gonna figure out stuff with these complex features. What d’you mean by elders - anyone over 18? I’m heading for 70 and I’ve no choice but to keep up. My elder brother is 80 next year and he can’t operate without accessing his stuff. I think motivation and maybe patience, rather than age, is the driver for coping with change. It’s not that hard. Really. Sometimes we even, you know, read an article that points out the new features. This elder loves the new Files app. Especially the iCloud files management—much better than the old iCloud Drive. crazy that we've gone full circle on file management and ended up with a much more complex environment that if we had access to the underlying file system. Back in our day, a file system was as good as the rubber band holding the stack of punch cards together! I think any of us who worked with punch cards and large floppy disks can handle a phone file system. When they finally allow you to mount an AFP or SMB share, only then will files become something of use for people who don't wish to depend on cloud based services to handle their documents. By allowing local file storage on your iPad and opening files from shared drives, and allowing apps to access those files, we could have a potential replacement (or at least a nice alternative) to laptops. I see google drive listed but when I click it I just get a smaller window to navigate and no option to share or add Apple files app. Any ideas? I get that with all my providers, even ones that have been updated to support files integration according to the developers. I’m hoping I’m doing something wrong because if that’s all you get, it’s a bit of a waste of time! How odd, this can’t be right. I would expect selecting a 3rd party provider would then populate the file manager on the right, instead I get a pop up list of contents. Totally unusable. Is there something wrong or is this it??? UPDATE: BOX is working as expected, exactly like iCloud Drive. Google Drive, Onedrive, Dropbox do not! Suspecting the third party providers maybe be at fault. 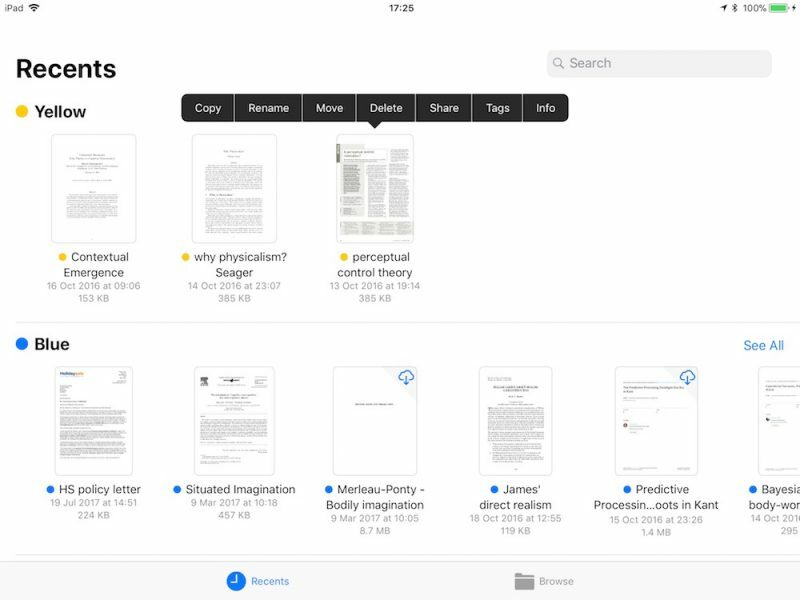 Apple have finally realised they need to provide a platform for discovering, manipulating and sharing data across their sandboxed OS to make the iPAD a credible data management and editing device. This was good timing having released 512GB iPAD Pro. Sadly, their first attempt is a lot worse than just useless. I say this because it promises enough to get people excited and wanting to try it but then fails to deliver in almost all areas. I'm flabergasted it can be this bad. The objective was to provide a flat interface onto all files stored on the device (across all apps) and stored in the major cloud collaboration services. Beyond that it would should enable search and drag / drop across all of these. So, what does it offer ? Firstly, even though I have the latest office 365 suite installed and have docs / spreadsheets / presentations / notes, under 'On My iPAD' there is nothing at all shown. As it stands, beyond this in the productivity area, I have Pixelmator, PhatPad, NotesPlus, AwesomeNote, Voice Recorder and iProjectViewer. Under Pixelmator, there is just the Pixelmator folder (I have created nothing there yet so no surprise). There are no entries for any of these other apps. Furthermore, as everyone who was honest would agree, the ability to share pictures, videos and audio files has always been weak to the point of impossible. You need iTunes that only runs on certain devices and it's management is awful. Where is the Photos folder, the Videos folder, the Music folder, the Voice Recorder folder ? These are just jpg, png, mp4, m4a, mp3 files. Why wouldn't you want to see them all in one place, browse them, drag and drop them to other apps ? Of course you would - that is the whole point of a creativity device and I understood (perhaps wrongly) the whole point of finally enabling a files capability. We are not talking about full file management. I knew we wouldn't get that because of the OS architecture, but there is no reason on earth why a flattened view of all On My iPAD files with basic meta data and full drag and drop shouldn't be possible on day one. Even if it worked for a few key apps like Office, that would be something, although without consistency, it would prove very irritating. Apple have access (like no one else) to the Sandbox for all apps. Unless a app developer did something proprietary encryption or created a db using non standard methods to store it's local files, Apple should have access to it. That's just the On My iPAD piece. Now let's look at cloud. I have personal Dropbox. That just pops up the Dropbox viewer over files, so there is no apparent integration. It doesn't even let you drag and drop a file from that Dropbox window to the other folders (cloud and On My iPAD) under files. What is the point - you get people excited, waste time and offer nothing - as I said, actually a lot worse that useless. I have corporate Box. This is via single sign on like most would have for business use. Every time I click the Box location, it says Authentication Required. When I do that sign in, it gives a full window Box display with an arrow to take me back to Files - again, it just launches with no integration and no drag and drop ability. As I say, each time I try box again, it says I'm not authenticated. Worse than useless. Filebrowser. Fantastic app, just like GoodReader. When you select this it says either Share with Apps or Network Folders. For the former a pop up comes up saying there are no files in the Share with Apps location and asks me to use FileBrowser to copy files to that location. The whole point here is that you should be creating dozens of staging copies to share files. Apple should enforce this as a basic capability unless there is a security focus with certain apps that have a good reason to block sharing otherwise, Files isn't of any use. For the latter (Network Folders) you pushed to buy an upgrade to FileBrowser. I assume, like the cloud apps, this will just be a launch of FileBrowser and therefore not a flat searchable view of all my files - so of no use to anyone. Why can't Apple have an option that enables viewing of all repositories across all apps. They've forced people to move to 64 bit apps so why not force all apps to use storage repositories compatible with Files ? There really isn't any excuse. This would also mean app providers didn't need to register with Files - it would just work - i.e. consistency. It doesn't. I'm sorry, but this is utterly indefensible. Part of the reason for getting my 10.5" Pro was because I thought Apple had finally woken up. Clearly they haven't. [doublepost=1506083588][/doublepost]And this is the whole point. Word etc is the defacto standard whether Apple like it or not. If you can't search, display and drag drop all files types using Files it renders the iPAD (of which I have 7 in the family inc the 10.5 Pro) as next to useless. You shouldn't have different ways of doing the same thing with different apps. It shoudn't matter if it's a just taken photo roll picture, an audio recording, a music file, a note, a drawing or a productivity file - it should just work. This is why contrary to what people like to say, Apple iOS devices are actually very hard to use for anything other than basic Apple owned app media viewing. Very disappointed.